Leo Lionni's first picture book has at last found its perfect format in this sturdy board book for the very youngest child. Little Blue and Little Yellow are best friends, but one day they can't find each other. When they finally do, they give each other such a big hug that they turn green! How they find their true colors again concludes a wonderfully satisfying story told with colorful pieces of torn paper and very few words. 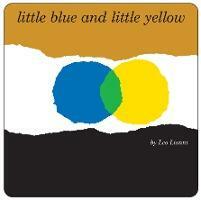 This classic tale of friendship also offers a playful introduction to color concepts.